- Click the "write" button and wait for the software to finish creating the bootable usb. Once installed reboot the HTPC and you should have a fully functional Kodi install. Easy huh? 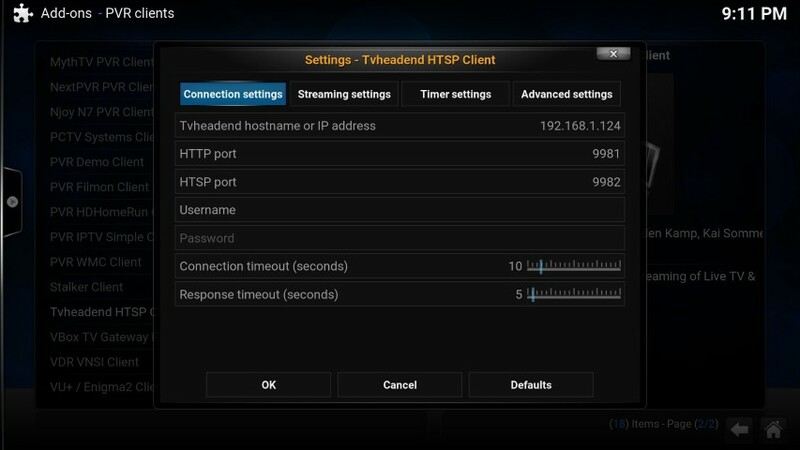 - To test access to your HTPC, inside Kodi go to Programs >> LibreELEC settings >> connections. Find your wireless connection and make a note of the IP address. In my case its 192.168.1.123 but yours will probably be different. Congratulations you now have a fully running free operating system with Kodi running on top of it. The best thing about LibreELEC is it is already customized with many Kodi enhancements, hardware drivers and shortcuts. In the next post we will go on to setting up a live TV server. Now we have a fully working Kodi install on top of linux, lets add some live TV functionality. NOTE: This guide is for UK users but should work in the same way around the world. USA is slightly different I think due to their broadcasting standards. The first thing we need to do is install a PVR backend. 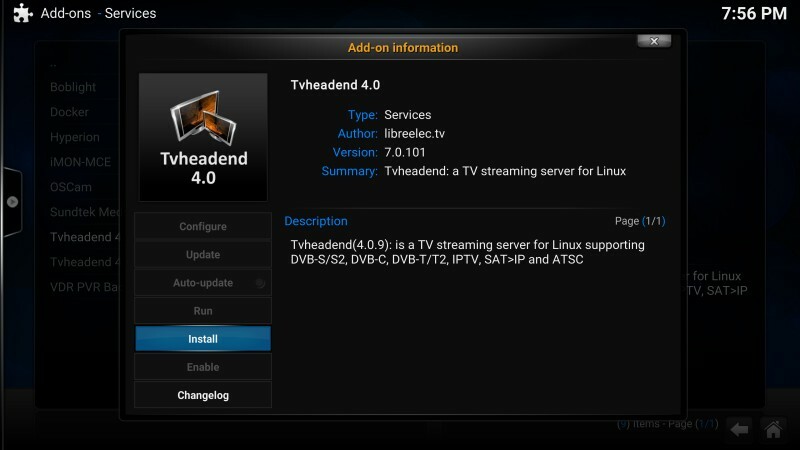 In this case I am going to use TVHeadend, but there are many others available for Kodi. 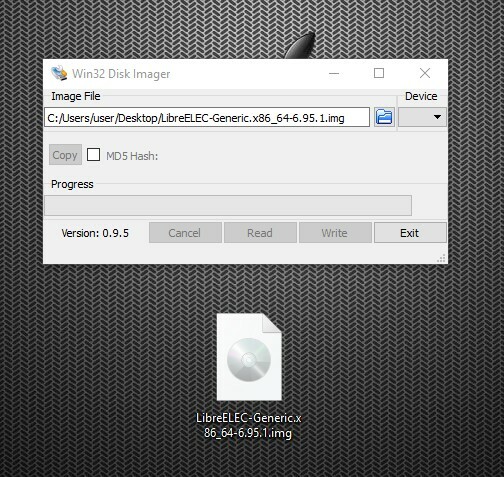 EDIT: A libreELEC developer writes that version 4.2 is now available and works better with the Raspberry Pi SD cards, has a setup wizard, timeshift capability and mass channel edit. This guide focuses on setting up version 4.0 at the moment but let us know if you install 4.2. Congrats you just installed the PVR software, who said Linux was hard to use? Think of the PVR backend as the server software needed to supply and organize your channels. Its a web based interface that works in any standard web browser. You should now see the TVheadend web interface. If you click about you should see the details of your PVR server version that is running. Congratulations, it works! We're most of the way there. 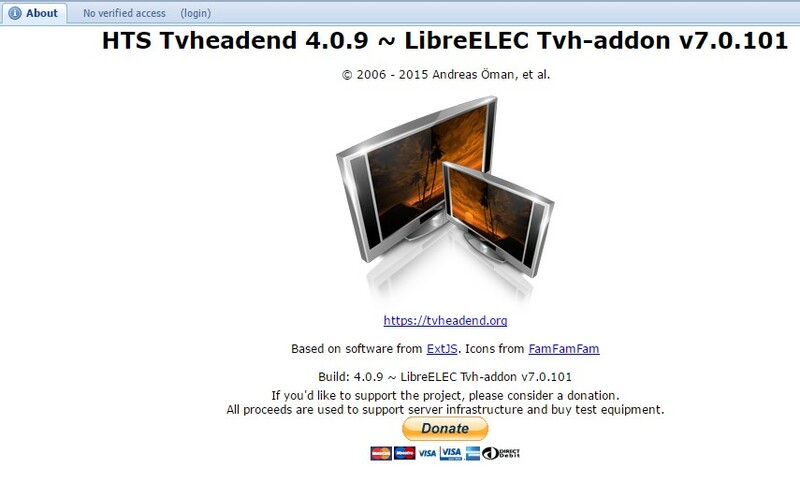 - In the TVHeadend web interface click on: Configuration >> DVB inputs. You should see your tuner device in here now. 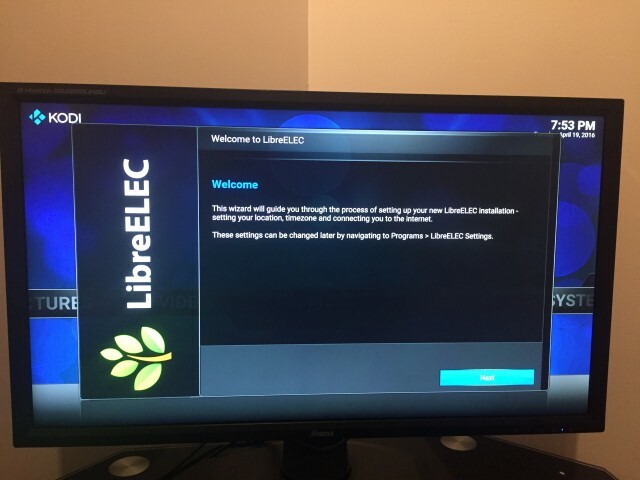 If you don't see it, check LibreELEC for driver compatibility. It should have all the popular PVR device drivers working out of the box though. - You will need to enable this device by clicking the folder icon below the tuner device, and check the "enabled" box. - Also uncheck the "idle scan" box. 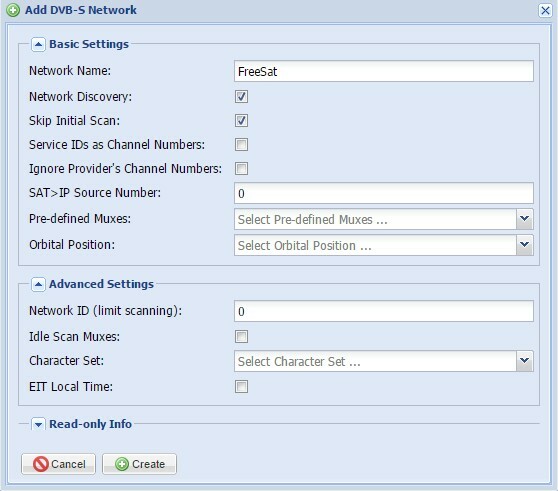 - Lets call our new satellite network "FreeSat"
- Now click on the "FreeSat" network you just created and hit the "Force Scan" button. Go to the Muxes section and you should see all the muxes being scanned. The scan status and scan result is the important field here, it should say PEND and OK. If the scan result says "fail" then check your cable connection. Go to the network tab and wait until the "scan queue length" field is 0. This may take some time. After about 20mins all your muxes should be scanned and you will now have a list of channels under the services tab. - Click on the "Map All" button under the services tab to map your services to a specific channel. In the case of Sky UK there should be about 450 channels to map and its pretty much instant. You should now have the channel names entered next to the specific service. This channel name is what will show up on Kodi eventually. At this point you can delete channels or rename them to whatever you want. 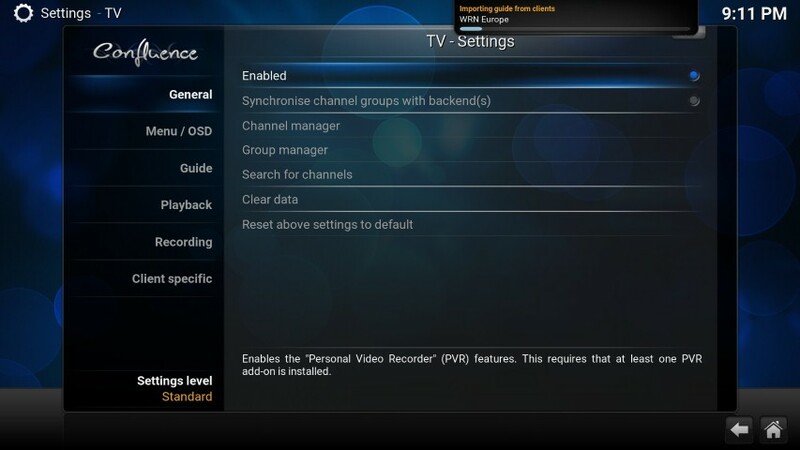 - Inside Kodi click the main menu item that has now appeared called TV. Click on a channel and you should be watching live TV in Kodi!! Live TV is now setup to work with Kodi. You can edit the channels using the web interface to your liking, add channel icons, or group them into categories. TIP: You can potentially put the live TV backend on any computer in your home, or even publicly available on the internet. 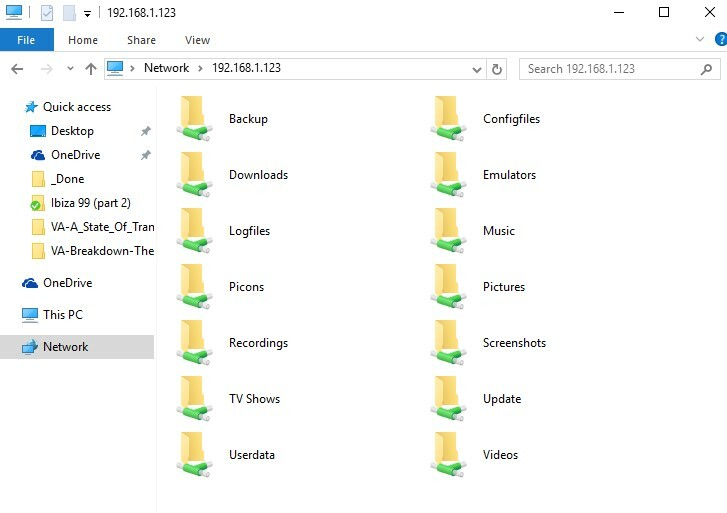 Imagine having 4 or 5 clients connecting to one tv server, there really are many possibilities. TIP2: You can use the Logo Downloader Add-on to automatically search for TV logos and add them to your Kodi install. It even has a context menu add-on to search manually with a menu on each channel. - Lets call our new satellite network "SKY UK"
Typo ? SKY UK and then FreeSat. Although it's obvious to the majority of people, there is bound to be someone that says your guide doesn't work. It's a nice guide BTW. Are you going to include a bit about mapping services, or does TVH 4 do that automatically for a new setup ? It's been 3 years since I set mine up and I can't remember !! Yep still a work in progress this guide. I got as far as scanning for channels then went to bed. Will finish off the mapping, channel logos and client Add-on install soon. OK guide finished and updated, hopefully that's a full guide to setting up live TV with a simple Kodi install and USB tuner. Let me know if there is any feedback from following this guide or improvements. I actually just did a guide for WeTek for ATSC tuners in the US (which are a PITA because you have to get EPG data from another source), but DVB is the bigger userbase. PVR users everywhere thank you for this, zag! Rather than mapping the channels via the services list as you've done above, it's much better to map the channels using the bouquets function (for 28.2e anyway) - as it maps only the channels for your specific region, rather than having duplicate ITV, Channel 4 etc. Using bouquets also automatically numbers your channel list and keeps on top of frequency updates. I'll do some more investigating myself soon and update the guide as appropriate. Updated guide with a few suggestions from the LibreELEC team. I always have to close then reopen the backend before muxes start scrolling. Between steps 3 and 4. Maybe just my set up. Does LibreELEC come packaged with MySQL?